Alectrosaurus was an Asian Theropod dinosaur that is related to Tyrannosaurus rex. It was a carnivore (meat-eater), and lived in what is today the Gobi desert in Mongolia and China, during late Cretaceous period, between about 83 and 74 million years ago. Alectrosaurus was probably a maximum of about 17 feet (5 meters) long, and probably weighed somewhere between ½ ton and 1 ton. A number of details of the creature are currently unclear, because only partial fossil specimens have so far been found. Additionally, some paleontologists have suggested that Alectrosaurus may actually be a species of Albertosaurus. The first fossil specimen of Alectrosaurus was discovered by George Olsen in 1923. It was named by Charles W. Gilmore in 1933. Literally translated from the Greek, "Alectrosaurus" means "unmarried lizard" - Gilmore, chose "unmarried" in the sense of "being alone" - at the time Alectrosaurus was discovered, it was thought to be quite unlike other Asian dinosaurs - although part of the reason was this was that a number of fossil bones from an unrelated dinosaur were initially also thought to belong to the animal. Asian Dinosaurs - Alectrosaurus lived in what is now the Gobi Desert, in Mongolia and China. Alectrosaurus was a species of dinosaur. "Alectrosaurus" means "unmarried lizard". Its name was chosen because when first found, it was very different from the carnivorous Asian dinosaurs then known. Alectrosaurus was a member of the Saurischia ("lizard-hipped") order of dinosaurs. What this means, is that although Alectrosaurus was not closely related to lizards, it did have similarly shaped pelvic bones. 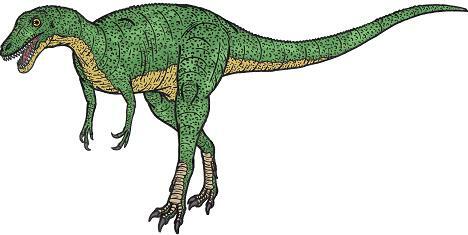 Alectrosaurus was a Theropod - a member of a group of related bipedal dinosaurs that included the ancestors of birds (although Alectrosaurus was not itself an ancestor of birds). Alectrosaurus lived between about 83 million years ago and 74 million years ago, during the late Cretaceous period. Alectrosaurus was a carnivore (meat-eater). The first fossils of Alectrosaurus were discovered in 1923, and named in 1933. Since then, a number of other partial skeletons have been found. Alectrosaurus was about 17 feet (5 meters) long. Alectrosaurus probably weighed somewhere between ½ ton and 1 ton.